One of boating’s growth segments is RIBs: rigid inflatables. Once regarded as inshore tenders or as boats for eccentrics, they are now in boating’s mainstream: RIBs are used for everything conventional boats are. A lot of the short-lifetime worries have disappeared as sophisticated synthetics have largely replaced pvc as the structural material for the buoyant tubes. Sun rot used to kill the cheap pvc imports. 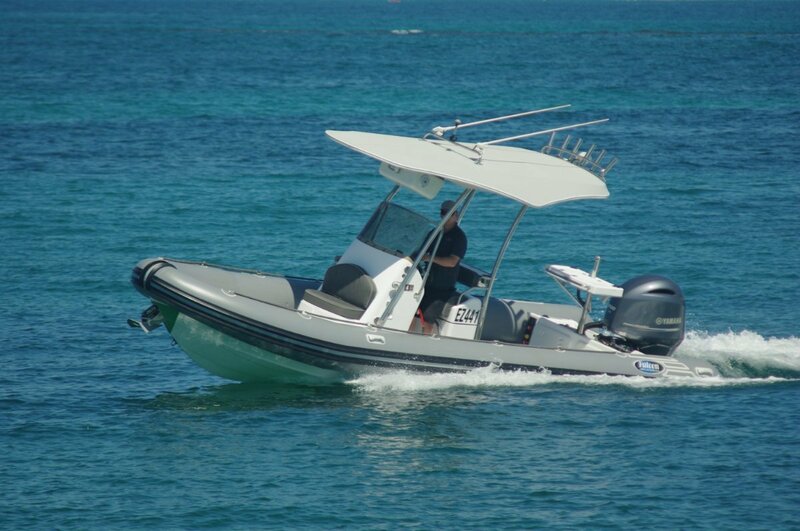 The review RIB, the Falcon 760 Sportfish is a partial import, one with very sophisticated tubes. Tubes and the fibreglass hull come from South Africa, a country long associated with RIBs. Everything else is made in WA by Sea Breeze Boating in Wangara. Everything else includes immaculately moulded fibreglass components and sculpture quality stainless steel work. The results deliver a thoroughly WA-style boat: a fishing boat adaptable to other kinds of leisure pursuits. The agents see RIBs as the preferred vessels of the immediate future, the typical buyer being the owner of a larger USA-sourced boat. This owner may be looking for a boat needing simpler looking after and offering a physically more comfortable day’s experience. The fisherman is well provided for. A rank of rod holders sits across the rear of the T-top; a first class bait board is mounted above the transom; a salt water deck wash is laid on. Cleats are provided for securing wear mats: these are dropped over the buoyant tubes to protect them if heavy catches are dragged over the side – or cray pots. A winch for hauling these is an option. For early starters the Falcon provides an LED floodlight. Lights generally are a feature of the boat with white LEDs within lockers and blue mounted as deck lights. Illustrating that this boat is not purely for fishing, the bait board’s support extends above it to become a ski pole. A variation on the Sportfish model to suit tender work replaces the bait board with a removable job and puts a settee across the transom. The Sportfish emphasises space for anglers with permanent seating limited to two on the driving seat and one or two ahead of the console. Others of course can sit on the tubes, but enough clear space has been left for six to fish comfortably. There is undoubtedly enough stability to cope with that number. The agents have been to considerable trouble to take all opportunities of inserting storage volume of assorted size units with varied specialised capabilities. An example is the small top opening box behind the driver’s seat. This is insulated, and is intended for holding sandwiches and the like; one of the commonly forgotten needs of boating. A 150 litre below deck locker further aft is also insulated. This can hold a slurry for the catch or simply contain ice for drinks and picnics. A duplicate, although not insulated, locker is under the foredeck. This is suitable for wet or dry stowage. Other stowage is in a pair of transom lockers and one in the driver’s seat back. Above that is a pair of tackle drawers. The major single unit, of course, is the console, and this is capable of swallowing more gear than most owners would dream of taking afloat. The large area T-top is technically a hardtop, but is a lightweight structure on a powerful stainless framework. Its unusual feature is a zip-open fabric lower liner. Unzipping reveals rod racks and stowage space for life jackets. The zips can be padlocked to give protection from thieves of opportunity. A 200hp Yamaha powered the review boat and did a fine job. It would be a pity to use a lesser motor on a boat able to exploit power and get you out there quickly. Naturally, hydraulic steering was installed. All the nice things were fitted: power windlass; twin batteries with VSR switching; stereo with Bluetooth module; high end electronics; fresh water shower. A very complete package.